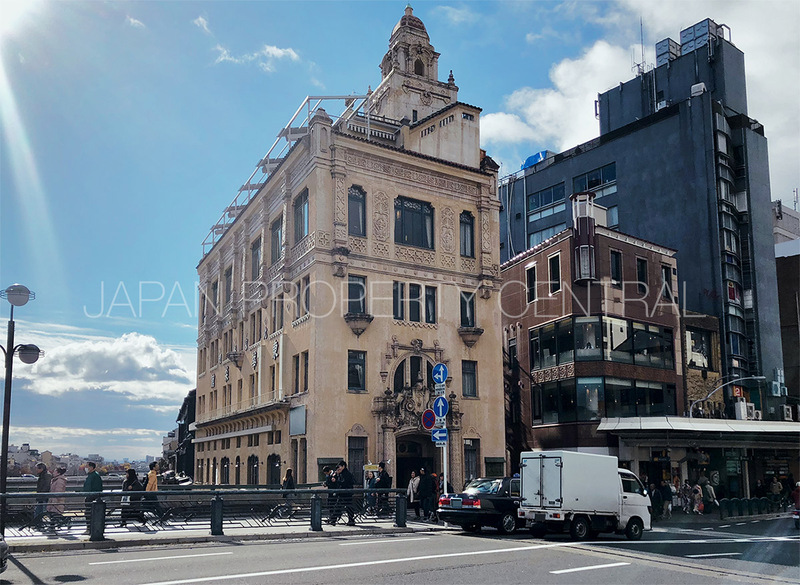 According to the quarterly LOOK Report published by the Ministry of Land, Infrastructure, Transport and Tourism (MLIT), land prices in Japan’s major cities in the second quarter of 2018 have increased in 95 of the 100 surveyed locations. This is the the highest share in the history of reporting, beating a previous record of 91 locations seen in the previous quarter. A gradual trend of land price growth continues across major cities. In particular, commercial land around transport hubs in regional centers has seen land prices go from no movement to a slight increase. In Tokyo, residential land prices in Bancho, Tsukuda / Tsukishima and Kichijoji have also shifted to an increasing trend. According to the quarterly LOOK report issued by the Ministry of Land, Infrastructure, Transport and Tourism (MLIT) in the first quarter of 2018, land prices have increased in 91% of the surveyed locations. This is the first time the percentage has exceeded 90% in the history of reporting. 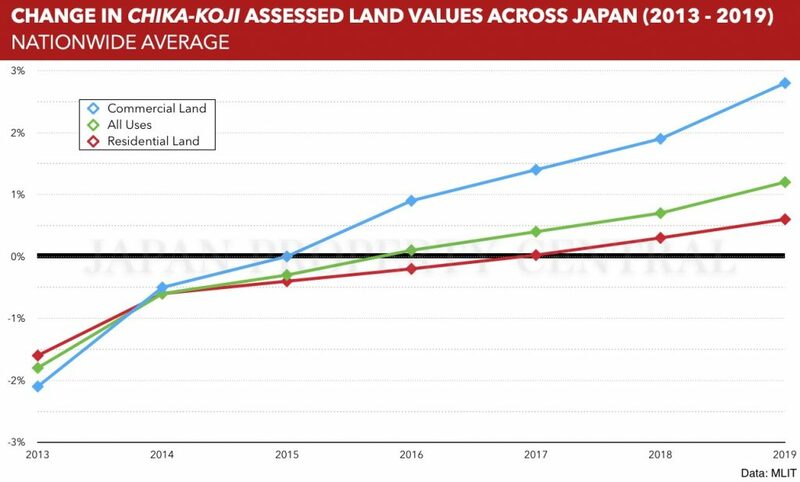 The main factors behind the rising land prices include positive conditions for the office market in central Tokyo, Osaka and Nagoya, major redevelopment projects, surging tourism numbers and expenditure, and strong demand for apartments that are close to transport. These factors are also encouraging investment into the office, retail, hotel and residential sector. 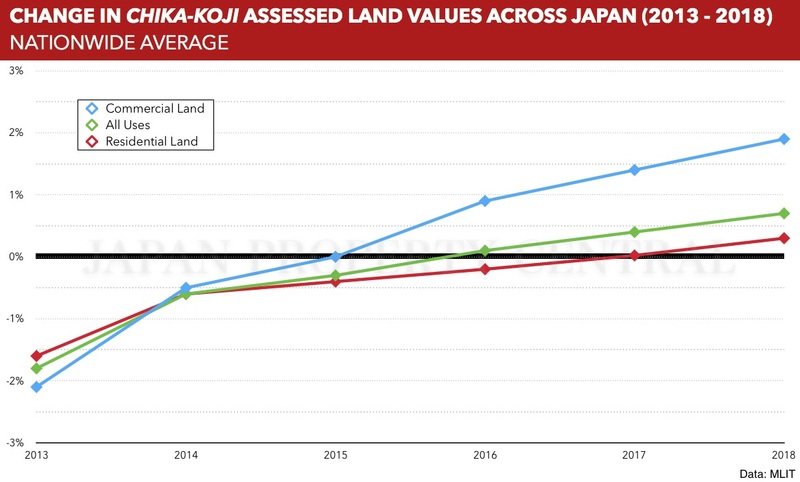 On March 27, the Ministry of Land, Infrastructure, Transport and Tourism (MLIT) released the Chika-Koji assessed land prices for 2018. According to the data, nationwide land prices across all uses increased by 0.7%, a 0.3 point improvement from 2017 and the third year in a row to record a year-on-year increase.Commercial land prices increased for the third year in a row with a 1.9% increase in 2018. 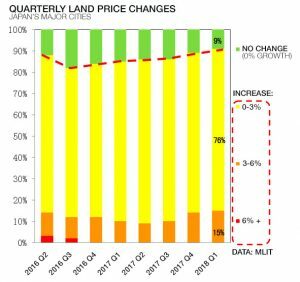 Residential land prices increased by 0.3% in 2018. In 2017, residential land prices increased by 0.022%, showing the first increase in 9 years. 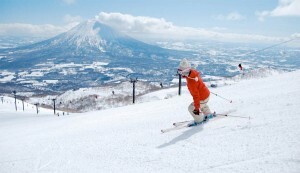 Notably, commercial land prices in Japan’s regional areas increased by 0.5% – the first increase since 1992. Residential land prices in regional areas dropped by 0.1%, although the rate of decline has reduced. 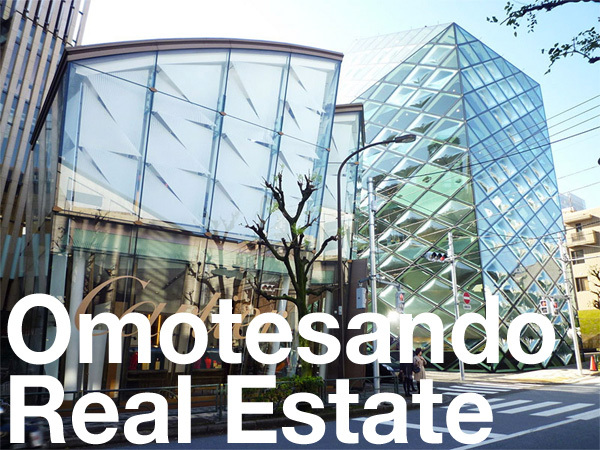 The most expensive land in Japan is the site of the Yamano Music Building in Ginza, Tokyo. 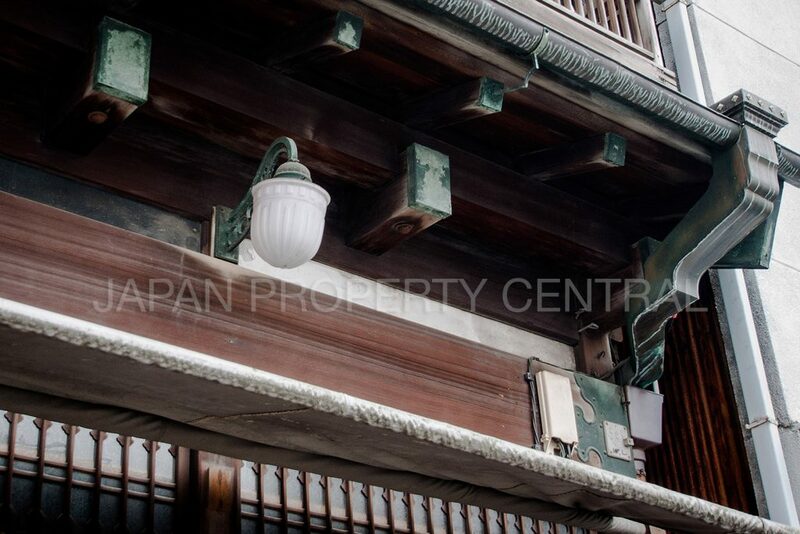 The land had an assessed value of 55,500,000 Yen/sqm (approx. 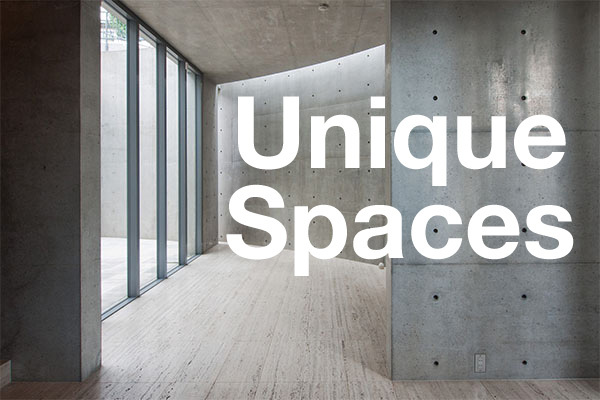 48,800 USD/sq.ft) in 2018, up 9.9% from 2017 and the fifth year in a row to record an increase. This land has increased in value by 275% since 2002.